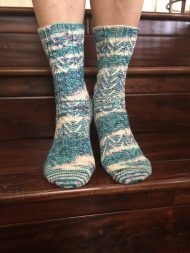 This top-down sock was designed specifically to show off the dye pattern in Baah La Jolla yarn that’s dyed in about equal portions of a solid color (shown in teal here), and white with speckles (shown in purples and golds here). The challenge in this design was to make the most of both dye patterns in the confines of a narrow sock circumference. After a bit of swatching, I chose a slip-stitch chevron pattern that allows the solid or speckled portions to “travel” above the striped background.